Materials: Jasper, Jet and Burgandy chips. It contains 23.5K Gold Leaf with Quartz and Noble Shungite, Turquoise and Brass shavings; one Topaz stone. 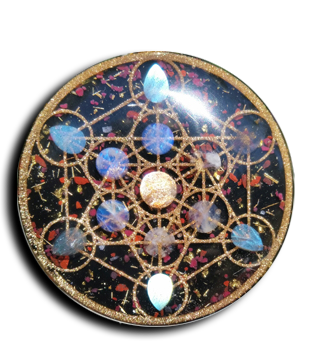 Excellent pendant size for those who desire an effective but small size orgone pendant. This pendant is cast with a custom brass powder and glow Seed of Life Lotus design. It features a Topaz stone.